The Philadelphia Gazette and Daily Advertiser (Philadelphia, PA) uses the spelling Kirlin for Matthias Kerlin. The Aurora. General Advertiser (Philadelphia, PA), Poulson's American Daily Advertiser (Philadelphia, PA), and The True American and Commercial Advertiser (Philadelphia, PA) use the spelling Mathias for Matthias Kerlin. The Aurora. 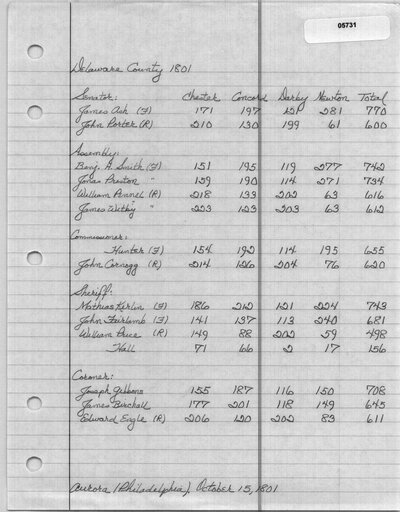 General Advertiser (Philadelphia, PA) lists John Fairlamb with 681 total votes, but the township totals add up to 631. It is the only source to inclue vote totals for Hall but does not include Lindsy. The True American and Commercial Advertiser (Philadelphia, PA), The Philadelphia Gazette and Daily Advertiser (Philadelphia, PA), and Poulson's American Daily Advertiser (Philadelphia, PA) list John Fairlamb with 673 total votes and William Price with 491 total votes. These sources list Lindsy's vote total but do not include Hall. Aurora. General Advertiser (Philadelphia, PA). October 15, 1801. The Philadelphia Gazette and Daily Advertiser (Philadelphia, PA). October 15, 1801. Poulson's American Daily Advertiser (Philadelphia, PA). October 15, 1801. The True American and Commercial Advertiser (Philadelphia, PA). October 16, 1801.